Enjoying playing Ben 10 games? Great! And Guess what? Here is another amazing game for all Ben 10 fans. 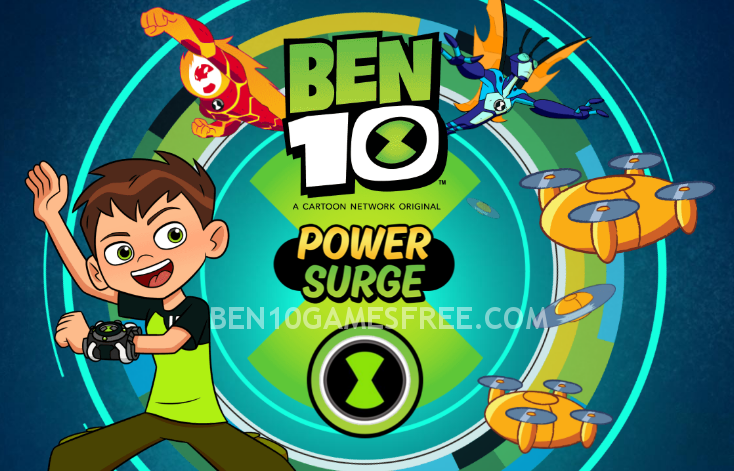 You can play Ben 10 Power Surge online for free on this page. With alien drones flying all around and an unknown evil kid has captured Rustbucket, help Ben 10 destroy all the drones to get Rustbucket back! Before you get ready to play, check out the important tips below to make sure you win this! Ben 10 Power Surge is a typical arcade game where you can have fun and enjoy killing some aliens. The game begins when an Evil kid captures Grandpa’s Rustbucket and tries to take it away. Ben finds this out and starts his chase. To help him chase, he calls Purple Upgrade who transforms into a drone and rides on it. Now, you have to control Ben and destroy all the enemy drones. You can transform into two aliens – Heatblast and Big Chill – to fight them all. Recommended: Play Ben 10 Alien Swarm game online now! Talking about playing Ben 10 Power Surge, you need to know the gameplay. This aim is to complete all the different levels and each level becomes harder than the previous one. In this game, you will have to face alien drones that fire at you. You have to maneuver Ben 10 in such a way that you avoid getting hit by the drone bullets or bumping into any of the alien drones. Also, you must not hit the ground too. One thing that you don’t have to worry about is the attack. Purple Upgrade fires automatically all you need to do is to attack in the right direction. As the levels get difficult, you will have to use alien superpowers to destroy the enemies. Here is the list of superpowers you can use in Ben 10 Power Surge. Remember, you cannot win the Ben 10 Power Surge game unless you collect bonus objects like Omnitrix power (green) and Super Attack power (yellow). When you destroy the special drones, they will leave behind such powers. When you collect the Omnitrix power, you will transform into other aliens like Heatblast or Big Chill. And, when you collect Super Attack power, there will be an automatic super attack that will kill all the enemies around you. Pro Tip: Keep an eye on the Top bar to know when are close a special drone. At the end of each level. the Rustbucket possessed by evil kid will appear and you have to defeat the kid to move to the next level. So, that’s all you need to know about Ben 10 Power Surge game. Now, it’s time to play. Destroy all the Alien Drones and Get Grandpa’s Rustbucket back. Good Luck!! Don’t Forget to give your rating for Ben 10 Power Surge Game and share your tips and tricks to win this game in the comments section below.